INCLUDES: 6 boxes of Nature's Path EnviroKidz Peanut Butter Panda Puffs Cereal (10.6 Ounces in each box). ALWAYS ORGANIC: Certified USDA organic, this delicious cereal represents the true values of EnviroKidz. This crunchy, flavorful cereal is Non-GMO Project Verified, gluten-free and does not include artificial colors, flavors or preservatives, synthetic herbicides and pesticides. PEANUT BUTTER SENSATION: Fuel your little ones with the energy they need and the wholesome ingredients you love when making Peanut Butter Panda Puffs your go-to cereal each morning. The delicious taste stems from the organic peanut butter and whole grain corn meal combined to create a crunch you can't resist. SAVE ENDANGERED ANIMALS ONE BOWL AT A TIME: Did you know that each time you and the kids indulge in EnviroKidz products, you are also paying it forward? 1 percent of all sales of every EnviroKidz cereal is donated to animal conservation efforts to save vulnerable species like the panda and kids' educational programs around the globe. GUILT-FREE SNACKING: When it comes to snack time, you can offer your adventurous kids something they can't resist - without the guilt. 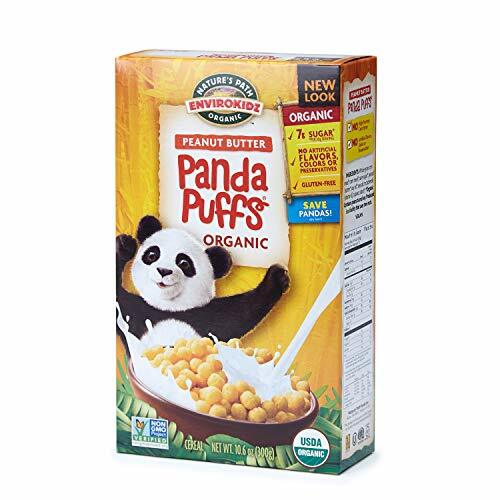 Peanut Butter Panda Puffs are organic, gluten-free and full of rich flavor stemming from wholesome ingredients. Opt for a tasty breakfast before heading off to the park or take a bag with you when the kids are craving a sweet, yet healthy snack. Final Price as low as $19.03 Shipped!